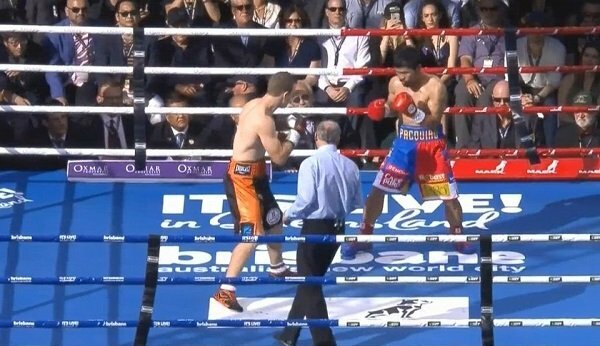 Results: Jeff Horn beats Manny Pacquiao in robbery! Jeff Horn (17-0-1, 11 KOs) used a roughhouse style of fighting tonight to beat WBO welterweight champion Manny Pacquiao (59-7-2, 38 KOs) by a very questionable 12 round unanimous decision on Saturday night in front of a huge crowd of 55,000 boxing fans at the Suncorp Stadium in Brisbane, Australia. Pacquiao suffered 2 bad cuts in the fight from a clash of head. Horn was cut over his right eye. This was one of the most exciting fights of the year. In some ways, it’s not such a bad thing the judges scored the fight in a controversial manner, because the boxing fans can see Pacquiao and Horn do it again. Horn head-butted Pacquiao a number of times, opening up cuts over his left eye and forehead. Horn was really hurt in the 9th. Pacquiao couldn’t get him out of there because he punched himself out. Pacquiao was missing over and over again with his left hands when he was trying to finish Horn. The mistake on Pacquiao’s part was easing off in the 10th round and not going after Horn to knock him out. Pacquiao let Horn win that round. Pacquiao did more than enough to win rounds 11 and 12. Horn threw Pacquiao to the canvas at one point in the fight. Horn’s game plan was to obviously rough Paquiao up and use his size advantage, which was considerable. Horn was a lot bigger than Paquiao, and perhaps the biggest fighter that he’s ever fought before in terms of weight. The scores were 117-111, 115-113 and 115-113, all for Horn. There is a lot of disagreement from boxing fans about the scoring for the fight, especially the 117-111 score. That judge seemed to be watching a different fight altogether. Boxing 247 had Pacquiao winning the fight by a couple of rounds. This is how things go when you’re the visiting fighter. You’ve got to give Horn a lot of credit for starting fast and giving Paquiao problems with his bull rushing style of attacking Pacquiao. Horn used a lot of movement that seemed to cause Pacquiao problems, as he couldn’t figure him out. It was a really difficult style for Pacquiao to understand the way that Horn was fighting. By the time Pacquiao finally figured out how to beat Horn in the 9th, he had already given away a lot of rounds to the Australian fighter. The way to beat Horn was for Pacquiao to attack him and hit him with a lot of shots. Pacquiao was only willing to fight in the way he needed to in round 9. In the other rounds, Pacquiao was getting the better of Horn with pot shots, and they were close. It’s understandable how the judges would score the fight for Horn. Pacquiao said after the fight that he wants to fight Horn in a rematch. Horn says he wants the rematch as well. Pacquiao will need to be ready for Horn’s rough style of fighting for the rematch, as he wasn’t prepared tonight for that style of fighting. Horn was lowering his head and ramming Pacquiao in the face all night long. Horn was also hitting Pacquiao in the clinches. He was even hitting Pacquiao when he had him in headlocks. It was really dirty stuff. The pro-Horn crowd was even booing him in the last 3 rounds for his rough style of fighting. You are here: Home / Boxing News / Results: Jeff Horn beats Manny Pacquiao in robbery!